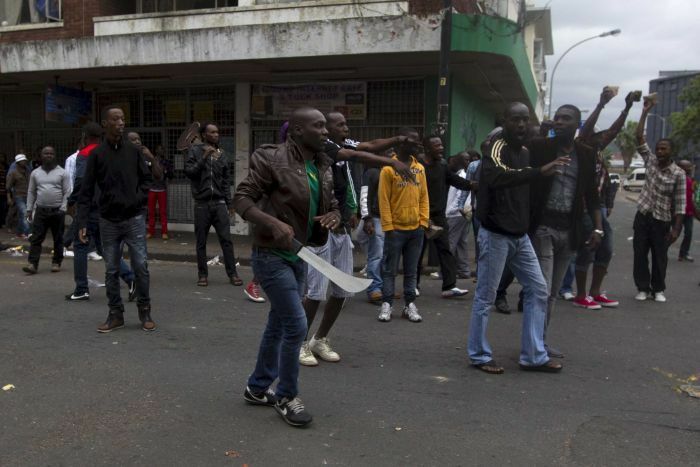 JNN 22 Apr 2015 JOHANNESBURG — South Africa is sending the army to townships around Johannesburg and Durban in the first deployment to quell civilian unrest since 2008 after attacks against immigrants left at least seven people dead. “We will deploy troops to volatile areas,” Defense Minister Nosiviwe Mapisa-Nqakula said in televised comments to reporters during a visit to Alexandra township in Johannesburg on Tuesday where a couple from Zimbabwe was shot late Monday. “We are deploying because it is an emergency.” The army will support police officers, who will take the lead in containing the violence, she said. South Africa is experiencing its worst anti-immigrant attacks in seven years as mainly foreign shop owners in townships are being driven from their businesses. President Jacob Zuma canceled a state visit to Indonesia this week to deal with the crisis. Police say they have arrested 307 people for public order-related violence in the past two weeks, and the authorities have promised to prosecute perpetrators. Some poor South Africans see immigrants as competitors for jobs and business opportunities in a country with a 24 percent unemployment rate and an economy hit by rolling power blackouts. The army’s Military Command held an urgent meeting to discuss the impact of the violence “on national security and stability” and agreed to a police request to provide support, South African National Defence Force spokesman Xolani Mabanga said in an emailed statement. Residents of Alexandra said the army presence may help calm the unrest. “It’s a good thing,” said Alphonso, a bearded 42-year-old man said as he repaired a leather shoe and sold candy and cigarettes from a table on the sidewalk. “Everyone is afraid of the army; it’s going to control the situation.” Originally from KwaZulu-Natal province and a resident of Alexandra for 20 years, he asked that his last name not be used for fear of being victimized. While the violence has subsided since last week, the attacks are an embarrassment for South Africa’s ruling African National Congress, whose members sought refuge in many African nations during the fight against white minority rule. Governments from Nigeria to Malawi and Zimbabwe have condemned the attacks and called on South African authorities to do more to contain the violence. Four people appeared in a Johannesburg court on Tuesday on charges of involvement in the murder of a Mozambican man on April 18 that newspapers photographed and published. The Zimbabwean couple shot and injured in Alexandra on Monday night was confronted by three suspects allegedly posing as policemen. Zulu King Goodwill Zwelithini on Monday condemned attacks on foreign nationals as he tried to deflect criticism that his comments last month fueled violence that left at least seven people dead. His speech followed comments the Durban-based Mercury newspaper cited him on March 23 as saying foreigners were depriving South Africans of economic opportunities and should return home. The king’s office said his comments were misinterpreted. Jay Naicker, a police spokesman in Durban, said he hadn’t heard of the army’s deployment. The anti-foreigner violence is the worst since 2008, when about 60 people were killed. This entry was posted in AFRICA and tagged Africa, Anti Immigrant, Johannesburg, South Africa, South African, Xenophobic. Bookmark the permalink.